"It will be windy tomorrow too." But actually we didn’t strong wind and it was very hot today here in Shirahama. 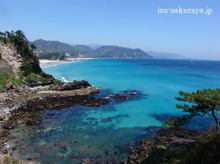 In addition, as we were able to see the island over the blue ocean it was a very beautiful scenery. 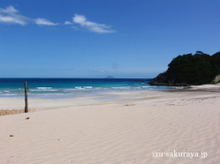 This entry was posted in beach on 2009年4月27日 by izusakuraya. 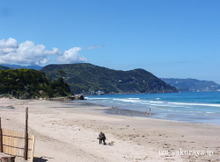 My family and I have been living in Shimoda for more than 15 years, but Shimoda and Shirahama make us very happy. 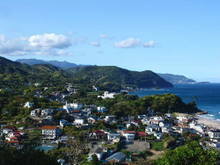 Because Izu peninsula has both the mountains and the beautiful sea and we can spend a happy time with them. Especially, in this season we can see the fresh green leaves on the mountains. So I love this season. This entry was posted in beach, nature on 2009年4月26日 by izusakuraya. It’s almost summer in Shirahama! Yesterday it was rainy and windy in Shimoda. But the weather was changed this morning and it was sunny and very hot in Shirahama. We have been very busy last weekend, so I went to the beach after several days. We can see the mountains from Shirahama beach and they are shining brightly by the green leaves. The green leaves make us refreshed, right? This entry was posted in beach on 2009年4月15日 by izusakuraya. I took this picture at the parking lot which is called "Miharashi-Hiroba" in Shirahama. Today it was very warm here in Shimoda. And when I went to the sea it was low tide and the water was very clear, so I decided to do "Snorkeling" there. I came back home and brought my wet suit, and then I went back to the sea…. This entry was posted in Sea on 2009年4月10日 by izusakuraya. This morning it was cloudy but it became sunny later! Yes, we were able to have a sunshine after 1 week. When I was cleaning our guest rooms I was able to see a blue sea! So, after I finished to clean up I went to the beach with my son Yuuki. On the beach we had a little west wind but it was very warm today!! 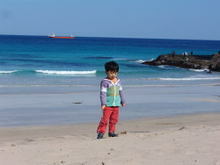 This entry was posted in beach, Family on 2009年4月2日 by izusakuraya. There are some kinds of cherry trees in our garden. 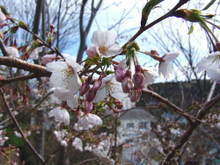 One of them is called "Kawazu Sakura", which blooms in Feburuary, but this tree is "Oshima Sakura". Oshima Sakura blooms in the same season of the most famous Sakura in Japan, called "Someiyoshino". I love the season which Sakura start to bloom, because Sakura tree has blossoms and a lot of pink buds, and it is very cute! This entry was posted in Flower, Pension Sakuraya on 2009年4月1日 by izusakuraya.